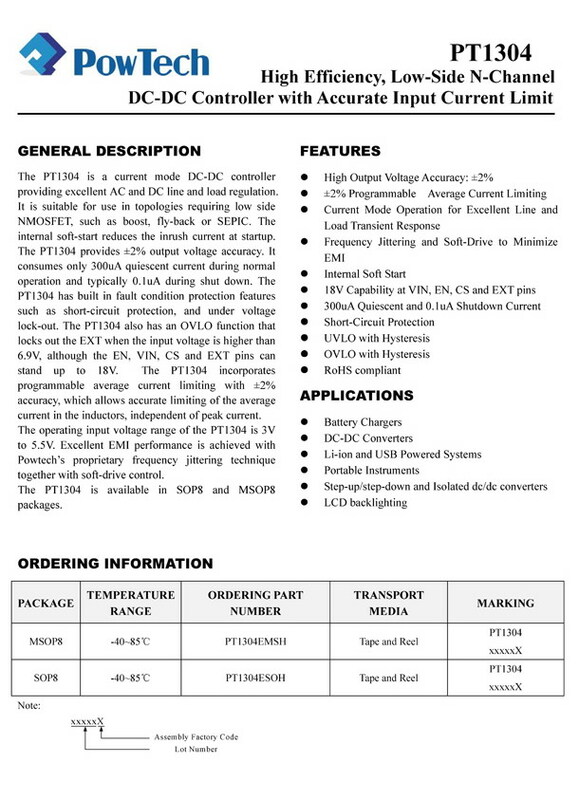 The PT1304 is a current mode DC-DC controller providing excellent AC and DC line and load regulation. 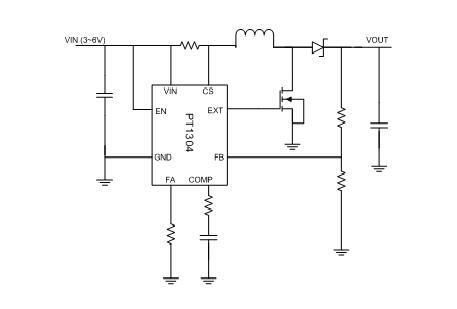 It is suitable for use in topologies requiring low side NMOSFET, such as boost, fly-back or SEPIC. The internal soft-start reduces the inrush current at startup. The PT1304 provides ±2% output voltage accuracy. It consumes only 300uA quiescent current during normal operation and typically 0.1uA during shut down. The PT1304 has built in fault condition protection features such as short-circuit protection, and under voltage lock-out. The PT1304 also has an OVLO function that locks out the EXT when the input voltage is higher than 6.9V, although the EN, VIN, CS and EXT pins can stand up to 18V. The PT1304 incorporates programmable average current limiting with ±2% accuracy, which allows accurate limiting of the average current in the inductors, independent of peak current. The operating input voltage range of the PT1304 is 3V to 5.5V. Excellent EMI performance is achieved with Powtech’s proprietary frequency jittering technique together with soft-drive control. The PT1304 is available in SOP8 and MSOP8 packages.